ONCHAN, Isle of Man – March 13, 2016 – More than €30 million in prize money is expected to be paid out by PokerStars, an Amaya inc. (NASDAQ: AYA; TSX: AYA) brand, at the upcoming PokerStars Championship presented by Monte-Carlo Casino®, which takes place from April 25 to May 5, 2017. The total cash winnings expected across the course of all 71 PokerStars sponsored tournaments has been boosted by more than $2.5 million in guaranteed prize pools, including $1 million guaranteed in the €1,100 PokerStars National Championship, formerly known as the France Poker Series (FPS) Main Event. After PokerStars Championship Panama, which is currently in full swing, the Championship heads to Macau (March 30 – April 9), before PokerStars returns to Monte Carlo for its first Championship along the iconic French Riviera. The jam-packed schedule features a wide variety of re-entry events, high rollers, lower buy-in tournaments including progressive Super Knockout formats, additional deep stack events, and increased registration times. Team PokerStars Pros confirmed so far include Felipe ‘Mojave’ Ramos, Jake Cody, Vanessa Selbst, Daniel Negreanu, Fatima Moreira De Melo, Igor Kurganov, Liv Boeree, Celina Lin, and Bertrand 'ElkY' Grospellier. For further information on all things PokerStars and Monte Carlo please see the PokerStars Blog. Monaco is home to Casino de Monaco - one of the oldest and most famous casinos in the world. PokerStars Championship Monte Carlo is held in collaboration with Casino de Monaco and will attract some of the world’s finest poker players and high rollers. Last year, the FPS event had a total of 1,261 entries (without the re-entry flight option) and last year’s Monte Carlo Main Event had a total of 1,098 entries. Satellites to PokerStars Championship Monte Carlo Main Event and PokerStars National Championship are currently running on PokerStars.com, and on March 19 there is a 20 packages guaranteed satellite to the PokerStars Championship Main Event (each package worth €8,500) and a 10 packages guaranteed satellite to the PokerStars National Championship (each package worth €2,500), followed by a 25 packages guaranteed satellite to the Main Event and a 10 packages guaranteed satellite to the National Championship on April 2. From March 14 to April 10, players also have the opportunity to turn €10 into a PokerStars Championship Monte Carlo package worth over €8,500 by playing fast-paced, special edition Spin & Go tournaments on PokerStars. In addition to this, satellite tickets to PokerStars Championship Monte Carlo will be available on selected tables at PokerStars during the Tuesday, Wednesday and Thursday MTT majors for three weeks from March 14. Players who buy their seat early for the PokerStars National Championship or PokerStars Championship Main Event before April 1 will be eligible to take part in Live Freeroll Flipouts that award the top two their buy-ins back. The flipouts will be organised at 11:30am on respective Day 1A’s. PokerStars is also offering a live 30 seat guaranteed Mega Qualifier to the PokerStars Championship Main Event and a 50 seat guaranteed live satellite for the €1 million guaranteed National Championship during the event. Both will take place at the Monte-Carlo Casino on April 25 at 4pm. Players must be quick to take advantage of a massive 33% discount (€931 saving) on accomodation at the Monte-Carlo Bay Hotel and Resort for PokerStars Championship Monte Carlo with the Monte-Carlo Hotel Early Bird promotion running from today, March 13 until March 20. Please note this offer is limited to the first 50 players. On top of this, any player taking part in the PokerStars sponsored National Championship who has previously won an FPS Main Event tournament in the past will automatically be entered into a special PokerStars Last Longer with a €1,100 PokerStars Live Event credit up for grabs. European Poker Tour Main Event title holders taking part in the Main Event will automatically be part of a special Last Longer where the last remaining EPT winner will win a €5,300 PokerStars Live Event credit. Whilst poker will take centre stage during PokerStars Championship Monte Carlo, there will be no shortage of entertainment throughout with the unmissable Player Party taking place at Blue Gin Bar bar on April 29 from 9pm, and #StarsFun activities and fun competitions, including the daily virtual reality high score leader board. 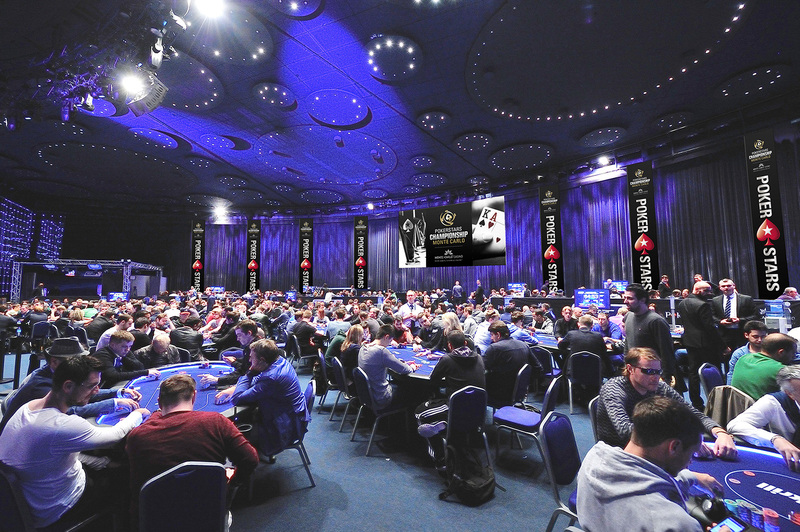 The cash game room will be busy during the event with experienced dealers running tables nearly 18 hours a day. For full details of the PokerStars Championship presented by Monte-Carlo Casino® schedule, please see: http://psta.rs/2mLqR6n. For additional details and press enquiries, please contact: press@pokerstarslive.com.